T-Mobile's Simple Choice and Google's Project Fi are good mobile options for international travel. 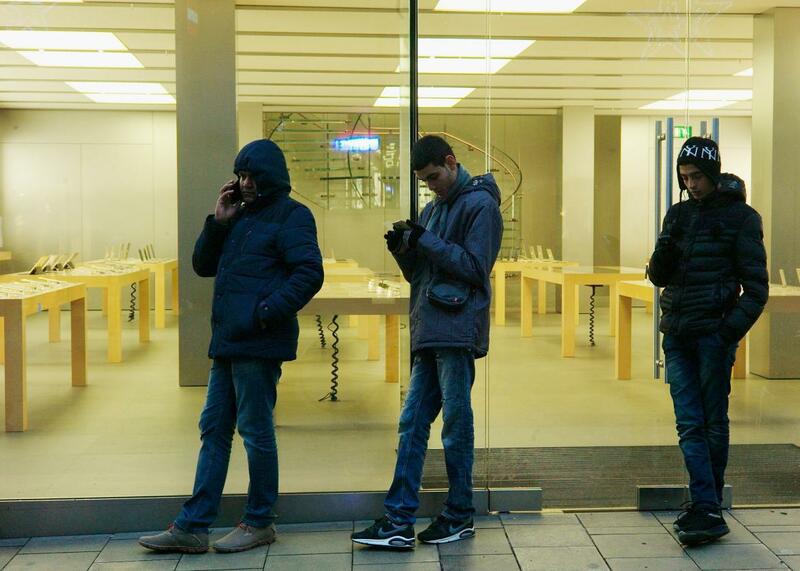 Young men use their cellphones outside an Apple Store, Jan. 1, 2016, in Munich. It wasn’t so long ago that heading on an international trip meant selecting among suboptimal choices for mobile communications. I could use my U.S. carrier’s roaming mode, paying extortionate prices for calls and especially for data. I could find and buy a local SIM card, offering much lower prices but making it inconvenient for people back home to contact me. I could find a Wi-Fi hotspot and, for voice calls, use Skype or other voice-over-IP Internet services. Or I could do without. But when I arrived in Munich for a brief visit last week, I turned on my phone and it just worked. While I was there, attending the Digitial Life Design technology and design conference, I enjoyed inexpensive voice calls and data access, with no hassles. How did this happen? The global telecommunications industry is still largely a collection of cozy national cartels. But technology advances and occasional pro-customer regulation are creating genuine competition, undermining the roaming rip-off. There’s a catch, of course: You may well have to change your mobile subscription plan, especially if you subscribe currently to the dominant U.S. carriers, Verizon and AT&T. If you travel a lot outside the United States and are paying out of your own pocket, the switch may well be worth it. The good deals come from two companies. One is T-Mobile, which broke ground with its Simple Choice plan. The other is Google, which is increasingly playing a telecom role in addition to its core advertising business. For several years, until recently, I paid T-Mobile about $50 a month for Simple Choice, a service that included a relatively small amount of U.S. calling minutes and data—but 10-cents-per-minute calling in scores of countries around the world plus unlimited data in those countries. The data abroad worked at slow 2G speed, but that was still good enough for very basic Internet access. I’m currently using Google’s Project Fi service. For this plan, Google combines telecom-carrier service—it uses T-Mobile’s and Sprint’s 4G networks in the United states—with Wi-Fi. It only works with specially configured hardware, currently three of Google’s own Nexus phones but presumably others at some point. The phones automatically hand off connections, including voice calls, to the best available network. Overseas, telecom-network calls are 20 cents per minute, but data works at 3G speeds. For all this I pay a $30-a-month base fee that includes 1 gigabyte. After I use up that 1 GB, which I doubt will happen, I’ll pay $10 per gigabyte. Google’s plan is superior for me—cheaper with better roaming data speeds and covering most places I visit. But T-Mobile works in some places where Project Fi phones only connect to Wi-Fi, such as Armenia, where I spent a week last fall. I would recommend either service to frequent international travelers. Project Fi is an experiment in many ways and innovative in its ambition and technological approach. It’s still very young, and not available to anyone who asks. You have to apply for an account in its “Early Access” stage. I was able to get one—which I’m paying for—after attending Google’s annual developers conference and testing its latest Nexus phones, which I bought. For me, the major drawback of the Google service is that I don’t know how to make it work, so far, with a third-party Android-based operating system such as Cyanogenmod. I prefer the third-party OS because it gives me more flexibility and because I can improve my privacy. I run Cyanogenmod on another phone that I’ve used for almost all of my U.S. mobile communications. The carrier for that is Ting, which buys wholesale service from T-Mobile and Sprint (much as Google does) and resells it at very low cost to customers. How low? My wife and I pay Ting roughly $50 a month and have all the voice and data we need, including tethering our computers to the phones for on-the-road Internet access. In months when we use much more data than usual, we pay more. Sometimes we pay less. It’s a good deal no matter what. I hope it lasts. The services I’m describing come from players that may well wish they, too, could be dominant and leverage that into overcharging customers. We need increased competition of various kinds—and spreading Wi-Fi coverage is one of the keys—but around the world mobile carriers are merging more than emerging. Less competition almost always means higher prices. For the moment, though, it’s gratifying to see cracks forming in the carrier cartel’s roaming rip-offs. Staying in touch on the road has never been easier or cheaper. The world isn’t shaking, but I call this progress—and, if competition rules, a harbinger of things to come.